Your learning here will be mostly based on real life projects such as construction of compost heaps and garden beds, building with bamboo or wood, as well as practicing your design skills working in small groups with your fellow participants. This gives you lots of opportunity to explore the various aspects of permaculture and discover the areas that are of most interest to you. Our courses are conducted by certified instructors and real experienced farmers, who have already delivered more than 50 courses for international participants. We always offer extra learning such as coconut oil making, shampoo making, harvesting in food forest, visiting spring water, traditional herbal shampoo, toothpaste powder, cooking in the nature (including healthy bread, cake, bamboo sticky rice, freshly made Thai Green Curry and a lot more), fire making, medicinal herbs and healing, and many more. After the course you will receive a certificate of permaculture education. We invite you to join us for finding your niche, growing your passion, and sharing the abundance, together and as individuals, for the betterment of ourselves and the planet. This course is suitable for those who are interested in living a more sustainable lifestyle, creating health and well-being for their community, and working towards an abundant, ecologically responsible future, such as backyard gardeners, farmers and agriculturalists, Environmental Studies students, landscape designers seeking a more sustainable dimension for their work, educators, projects or homeowner who want to invest their property for long-term productivity and sustainable living, or those who are looking for the answer of contented life style. Please state "Your Name and Course Month" in the transfer detail for our reference. Then inform us about your transfer and email us the receipt or any other proof of the transfer. 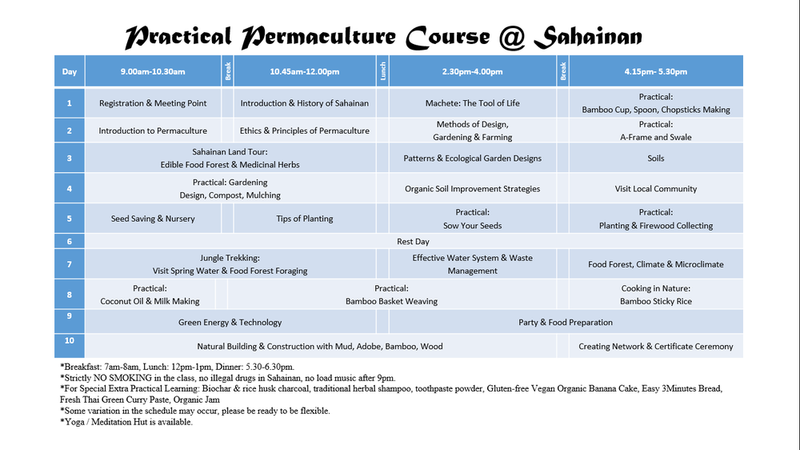 If Sahainan Permaculture Organic Farm have to cancel the course, the paid deposit of 3000 Bath will be fully refunded. In case a participant cancels his or her participation in the course, the deposit of 3000 Bath can not be refunded. Our courses fill up fast so please save your space once you have decided. To support the local Thai, we offer one full scholarships to English speaking Thai who are either gardener, farmer, NGO, or working in the field of sustainability. Participants are encouraged to bring along own notes and stationeries, flash light, organic soap, water bottle, sensible clothing, hat, sensible footware, own towel, tissue papers, bed sheet, and personal medicine. If you are a fire enthusiast and love learn how to make a fire on a fire pit, please bring along your lighter. For more detail about the facilities, and how to come to our farm, please go to "Volunteer" and “Direction” page in our website (www.sahainan.com). You can also visit "Gallery" or our Facebook page “Sahainan Permaculture Organic Farm”. Please do not hesitate to email us if you need further information.